The maxim of science is simply that of common sense—simple cases first; begin with seeing how the main force acts when there is as little as possible to impede it, and when you thoroughly comprehend that, add to it in succession the separate effects of each of the incumbering and interfering agencies. Collected in The Works of Walter Bagehot (1889), Vol. 5, 319-320. 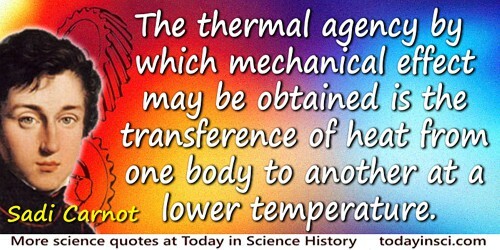 The thermal agency by which mechanical effect may be obtained is the transference of heat from one body to another at a lower temperature. 'Réflexions sur la puissance motrice du feu' (1824) translated by R.H. Thurston in Reflections on the Motive Power of Fire, and on Machines Fitted to Develop that Power (1890), 139.